Since Janssen and I both recently became stay at home moms, and consequently went from a two income family to a one income family, we both decided to respond this week to Aleta's email about preparing to live on one income. Janssen covered a lot of the important and basic things to think about before the switch to a one income family, so I want to talk about a few specific things that I have done to contribute to the finances now that I'm a stay at home mom. In January of this year, I was laid off from my job, so we unexpectedly became a one-income family a few months before we planned to (I was already planning to quit when the baby was born). However, it wasn't too much of a concern because one of the years of our marriage I was in school and Philip was able to cover all our expenses with just his income, and now two years later he was making significant more money. However, our "extra" money (my income) that was all going straight to savings, was suddenly gone. So although I didn't need to financially contribute, I still wanted to. And as a stay at home mom, so can you. Now, each of these are pretty small things that don't really bring in a ton of money. But all of them combined add up and contribute a significant amount to our finances each month. So although I don't need to do these, it gives me something to do, gives us more of a financial cushion, and adds a tiny bit to our savings account each month. And all the while I can stay home with my baby and feel good about that. Anyhow, it would be a lot harder for me to do make/use/wash cloth diapers (which saves us a lot of money) if I were working (even from home). It would a lot harder for me to plan and prepare homecooked meals everyday if I were working, even from home. It would be a lot harder for me to make all my Christmas gifts for family if I were trying to keep up an etsy shop. All of these things would still be doable, but harder. Or probably I would have to pick and choose and not be able to consistently do them all. 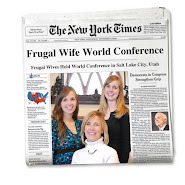 I guess my point is, not working--even from home--is part of what makes being a "frugal wife" possible. At least for me. I am grateful I have the time available to me to sew, can, cook, etc.